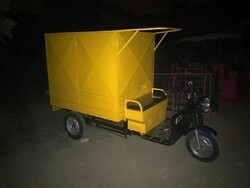 We are a leading Manufacturer of e loader rickshaw from Faridabad, India. Since the inception of our organization, we are offering a wide array of E Loader Rickshaw. The offered rickshaw has longer service life, optimum performance, and low maintenance, excellent functionality, noiseless, pollution-free and user-friendly. Apart from this, our offered rickshaw has the sitting capacity of more than eight people.